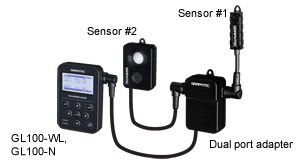 It is modular type that is able to support variety measurement by exchanging the input module. Multiple sensors and the input terminal are available for corresponding to the application. *1: it is required to use the same type sensor and it is used in the same power system of the single- or three-phase. GL100 will feature package solutions that combines several sensors and modules together for a one stop solution as an out-of-box-ready item for the specific application that best fits yor need. * Thermistor sensor is not included. 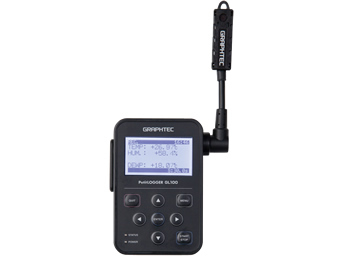 The GL100 is able to use with the PC or the Smart devices. 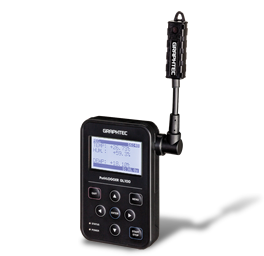 The data on the GL100 can be monitored using the software. General purpose application software will continue to have the ability to view in Y-T chart, waveform, and digital values. It is able to be also controlled the GL100 in real-time. General purpose application software has the ability to view in Y-T chart and digital values. The displayed information will be refreshed by request. The simple settings of GL100 are able to control. * It is available for the Android OS and the iOS in the Google Play or App Store. The most recent captured data is displayed in the digital value, trend graph or the alarm history. It is updated by operation of synchronous. The new industry-specific customize software will feature targeted software in accommodating users with indicators that are specific and familiar to that industry. 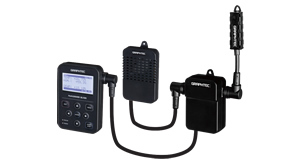 The following configuration is available to communicate with the GL100. The available function varies by the configuration. 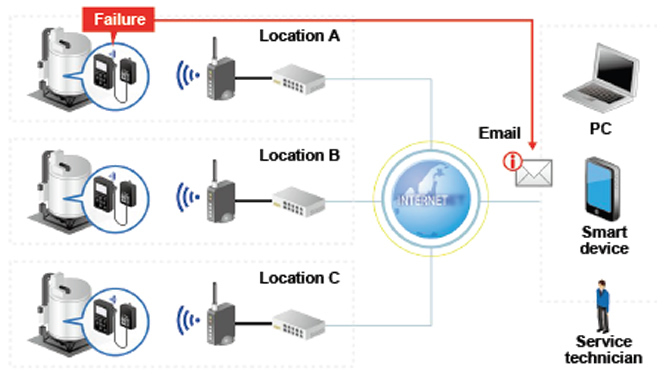 * When the router has the static IP address, it is able to access from the Internet (WAN) using the static IP address. * When the DDNS (Dynamic Domain Name Server) is used, the ISP provide the DDNS service and the router supports the DDNS. The router will have the domain name. It is able to access from the Internet (WAN) using the domain name. The captured data is able to save to the built-in memory or the microSD memory card. It has sufficient capacity of data. Condition: Using with Temp/Humidity sensor (GS-TH) by 1 minute sampling interval. * File size for captured data is up to 1.9GB on the microSD memory card. Condition: Using with Temp./Humidity sensor (GS-TH), 1 minute sampling interval, Alkaline battery (AA size x 2). The microSD memory card is not installed. * The operating time varies by the environmental condition. * USB power source will be required for Voltage/Temp. 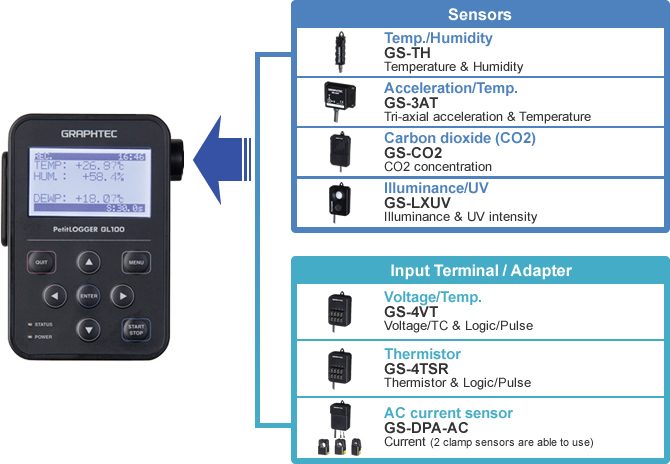 (GS-4VT) and CO2 sensor (GS-CO2). *1: GS-DPA (Dual Port Adapter) is used for connecting two sensors. *2: When GL100 is driven by the USB bus-power, power is automatically switched to battery after USB bus-power is down. If the capacity of the battery is low, the power of GL100 may be turned off. The battery is able to use as an auxiliary power of a power failure of the USB bus-power. In this case, it is recommended to install new battery to GL100. *3: It is able to drive by battery. In this case, an operating time will be shorter because power consumption is relatively high. *4: When AC adapter for the USB device is used, it is recommended to have power capacity of the 200mA except to use the GS-CO2 sensor. The power capacity of the 1A is required for using the GS-CO2 sensor. 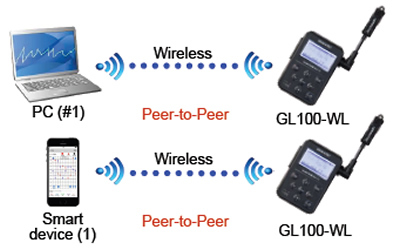 The GL100-WL is able to transferring email and receiving email. The warning and other messages are transferred from the GL100-WL. 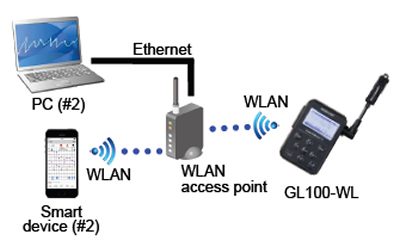 The command of simple control for the GL100-WL can be received. You do not need to sensitive for the measured values at all times because you are able to have the better understanding of the situation by receiving email from the GL100. Setting of capture condition in the GL100 can be changed by receiving command by email. 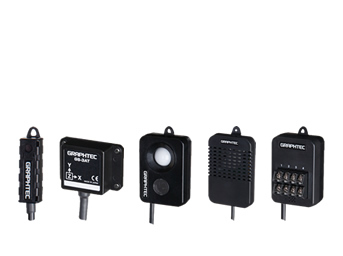 The typical applications using the GL100 series are the following. 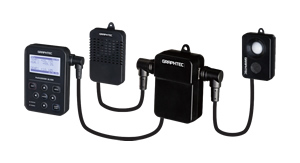 GL100 series can be used for a variety of purposes in a wide variety of applications. Industry: Maintenance Business sector: Maintenance, Upkeep Recommended model: GL100-WL/N Description: Monitor the power of high power equipment for maintenance and saving energy. In In this example, the power of the air conditioner of building is monitors in offline. History of the amount of power is checked periodically. Industry: Transportation Business sector: Quality management Recommended model: GL100-WL/N Description: Confirm the vibration of the cargo. Safety measurements through monitoring the vibration of the transport vehicles can be vital to heavy-industrial and vibration sensitive equipment. In In this example, the acceleration on cargo bed of the track is measured. The data is checked in office or warehouse. The time and value that acceleration exceeds the threshold are displayed in the list. 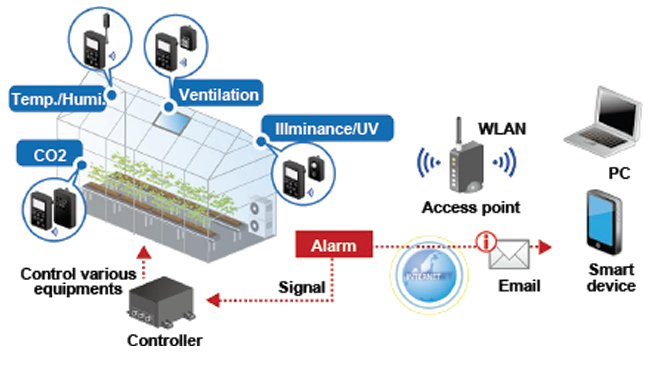 Industry: Horticulture Business sector: Management Recommended model: GL100-WL Description: Monitor the vital indicators for healthy plant growth. Creates the best conditions applied for growth, flowering, and fruiting using temperature accumulation and optimal growth environment analysis. In In this example, the Temperature, Humidity, Carbon dioxide (CO2), Illuminance, and UV are measured for it. When alarm is occurred, the warning message is transferred via email. Industry: Heavy machine, Heavy equipment Business sector: Service, Support Recommended model: GL100-WL Description: Monitor the operating condition of the equipment located in many place at one place. It makes shorter time to find the problem, and then service technician will be able to take action at an earlier time. Note: Assign a static global IP to router of each location. Or DDNS service must be available within network.